If you find yourself feeling really “off” during the detox and you haven't gone to the bathroom in a while, make sure to drink plenty of water and try an enema. It's amazing how moving the detox waste out of your bowels can make you feel better quickly. Make sure you're using a colon corrective formula and psyllium or oat bran fiber to facilitate waste removal. For those of you who complain about hunger, that should fade as you continue on. Hunger literally goes away. It's usually not hunger that makes you want to eat again; it's habit and boredom. For the next couple of days, keep in mind that detoxes and fasts are characterized by ebbs and flows. You have periods where you feel spectacular, energized, and alive. Then without warning, you feel sluggish, off, or even ill as the toxins make themselves known. Remember, this is not an endurance contest. If you reach a point that you feel is unbearable, listen to your body and back off. You can always do the detox again later. On the other hand, if you're feeling merely uncomfortable or somewhat "off," stick with it. You will come out the other side. 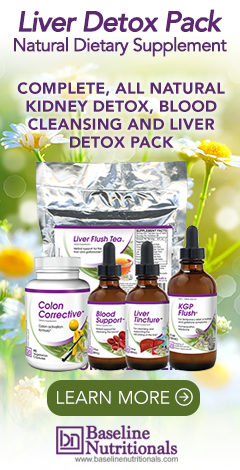 By the way, a side benefit of the detox is that you may notice your senses starting to come alive tomorrow – the third day of the detox. Taste, smell, vision, etc. can become greatly enhanced. Be aware and enjoy! During a detox, your body gets to talk to you. It's important that you listen to it. TIP FOR DAY TWO: Everybody is on a juice fast today – no salads or whole fruit allowed for the next three days. Only juice and green food: Spirulina, Chlorella, Blue Green Algae, Green Barley extract, etc. 2. Then, consume 4 droppers of Blood Support™ and 4 droppers of Liver Tincture™. Note: A dropper equals 1ml, as marked on the dropper. 3. Turn on stove and simmer Liver Flush Tea™ for at least 20 minutes. Then turn heat to as low as it can go to keep the tea warm for you to scoop out as needed throughout the day. IMPORTANT: Any time between now and lunch, feel free to have some diluted fruit and/or vegetable juice. You don’t need to wait until lunch to have this, the point isn’t to starve yourself. This is not a fast, this is a cleanse. And start drinking your potassium broth! 1. Consume 4 droppers of Blood Support™ and 4 droppers of Liver Tincture™. Note: A dropper equals 1ml, as marked on the dropper. Now is a good time to take Colon Corrective and have more Liver Flush Tea. At night, turn off the heat to the tea and just top the pot off with water and add 2 more tablespoons of Liver Flush Tea to the mix and repeat the simmering process in the morning. Each day, the tea just gets stronger and richer. When the taste gets too strong for you, pour out and start fresh. Tip: On your printed Detox Daily Diet Chart, it may helpful to cross out the boxes as you complete them to help you keep track of where you are for the day. For example, once you complete the “wake” and “1 Hour Later”, put a big X through them.